One of the grimest episodes in the history of Prestonpans was the persecution, torture and execution of its so-called witches, most particularly from the end of the 16th until well into the 17th centuries. The Prestoungrange Arts Festival has resolved from the outset to retell the story showing the greatest respect for those who were put to death. 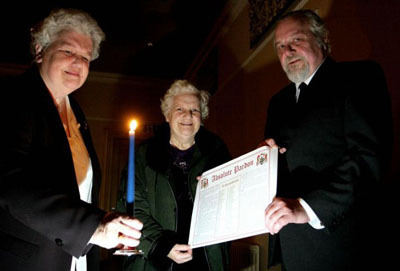 As such it was fitting that the first act was the granting of an Absolute Pardon to all 81 named individuals by the Judgement of the Barons Courts in 2004. That ceremony was circulated around the globe by press, radio and tv. Links have been made with Salem, Massachusetts USA. 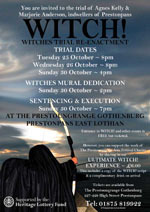 Each year at end October, that season known as Hallowe��en is taken as one for Remembrance of the unjustified execution of the 81 Witches of Prestonpans. A week long programme of activities and events is arranged. Details from 01875 819922 and from Forthcoming Events at the Prestoungrange Gothenburg at that time of year. Visitors to the Prestoungrange Gothenburg can take The Witches�� Tour in their own time with the accompanying booklet with the opportunity to take a meal with Witches�� Absolut Pardon Ale in the Bistro. Alternatively, a ��guided�� tour can be arranged for parties by telephoning 01875 819922. The scholarship that has guided the Arts Festival��s activities comes from East Lothian historian Roy Pugh. Following from his original book The Deil��s Ain and his commissioned theatrical triology of trial re-enactment first presented in 2005, Roy Pugh��s research, complemented by that of Annemarie Allan [#21 in the Prestoungrange University Press Historical Series] has also been the basis for the painting of a mural and exhibit sequence at The Prestoungrange Gothenburg. A mural sequence partly funded by The Heritage Lottery has also been created. The news stories before and since the Absolute Pardon are listed and linked here and beneath several of the mural scenes. Cuthill Park Witch Mural Unveiling and More to come .